On this page the end-user can see the services that are available for him to order. They are displayed as card items like in the following image. Only products that have a Public status are shown for the end-user. In order to create a new service that an end-user can order, you need to login as staff and create a new product. More on product creation: here. After you create a new product, it will appear on the Order services page on the end-user panel. 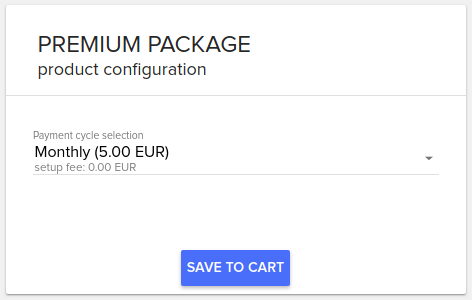 Pressing the Order button from the bottom of a card will send the user to a confirmation page ( like in the following image ) where he can choose the payment cycle then save the item to the cart and finish the order.